Five bedrooms, four bathrooms, immeasurable magic. Storytellers Villa is located in the Indian Creek community, just four miles from Walt Disney World. Come on in, and let us show you why Storytellers Villa has everything you need to make your next vacation sparkle. Just South of Walt Disney World in the Indian Creek community, Storytellers Villa offers the ideal location for theme park touring. Close enough to pop back from the parks for a midday snack, or a cooling dip in the pool before returning to the parks for Disney's unmissable evening entertainment. The Indian Creek community features outdoor play areas within easy walking distance, including tennis and basketball courts and a children's play area with slides, swings and a climbing frame. Click here for more about Indian Creek. Only a couple of miles away from a supermarket, a pharmacy and an array of restaurants, shopping and entertainment. If golf is your thing, Storytellers has three world-class golf courses within a few minutes drive. Universal Orlando Resort, including the amazing Wizarding World of Harry Potter, is only twenty minutes away. An additional ten minutes will get you to Orlando International Airport (MCO). The epic and historic Kennedy Space Center is 75 minutes away by road. Storytellers' resplendent outdoor spaces have everything to make your stay unforgettable. There's enough here to make you forget all about the world-class theme parks and attractions that surround you. Whether you want to relax or play, the SW-facing heated swimming pool and oversized spa capture the perfect blend of blue skies, glistening waters and Florida sun. A poolside sun station has enough loungers for all the sun worshippers in the family. The shaded lanai features cushy seating and an outdoor HDTV for all those who aren't... After all, why should enjoying the Florida sun mean you have to miss your favourite shows? The gas barbecue and outdoor dining area offers a delectable new take on 'eating out' - the menu is limited only by your imagination. The unique private outdoor golf putting green is a wonderful way to enjoy some family time (or some alone time). To truly relax, you need space - space that Storytellers has in spades. With all the comforts of home (and a few more besides) you'll not want to leave at the end of your stay. Allergy sufferers will appreciate the electronic air cleaning system, which purifies the air by removing airborne particles and allergens... and yes, there's free wifi. With five bedrooms and four full bathrooms, there's plenty of room for everyone to enjoy the vacation. The Verdant Retreat is the first master bedroom at Storytellers. It features an opulent king-size bed and an en-suite bathroom. 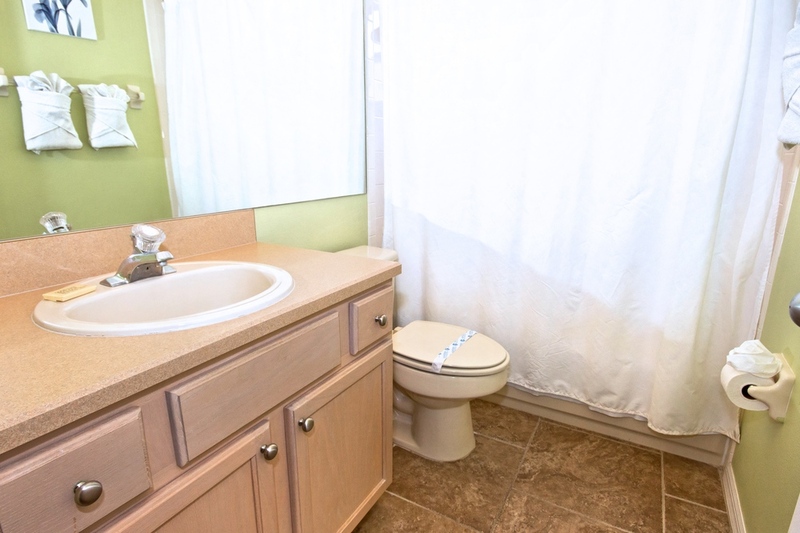 The en-suite includes twin basins, a bath tub, a separate shower enclosure and a walk-in closet. The bathroom benefits from direct access to the pool deck. Like every bedroom at Storytellers, The Verdant Retreat features a ceiling fan and a 40in HDTV with access to high-definition cable channels, a blu-ray player and Netflix. Storytellers' second master is a spacious queen master bedroom suite with its own en-suite bathroom. The Freshscape Suite features two closets and direct access to the pool deck. With a queen bed and funky city skyline themed bedding, the bold and modern Cityscape Bedroom never fails to impress. Situated right at the front of the house, Cityscape features a bathroom just next door, ample storage space and, of course, a 40in HDTV. The two twin bedrooms offer a playful place to lay their tired heads after a busy day's fun at the parks. Pirate Cove will have your little pirates running for bedtime. The newly-remodelled Arendelle Bedroom is cosy and welcoming but remains strangely... 'Frozen'. Both kids' rooms share a colourful bathroom. A contemporary take on the games room concept, Storytellers' unforgettable entertainment space offers a captivating blend of fun and technology. The cinema comfortably seats nine in stadium seating, so everyone gets a great view of the 122in HD screen (yes, that's 10ft!). Your Mickey ears are in for a real treat with the Andrew Jones Signature Series 5.1 surround speakers and the LED lighting on the steps isn't just an important safety feature but also adds to the magic of the silver screen, or at least its sparkle. Truly, custom built for your pleasure. A 60-game multi-arcade machine and a Jurassic Park pinball machine complete the lineup and are ideal for family competitions. Be warned - they're seriously addictive!